Sacrebleu Paris is a purveyor of tailored discovery experiences for discerning travelers who spend time in the city of lights. They gave us a challenging mission: redo a brochure with new offerings, with a very open brief. Sacrebleu Paris's CEO gave us one simple instruction: just do it. She trusted us and gave no directions but let us come up with the concept and deliver to her expectations. Our goal was to present the dearth of information in an easy, relatable yet luxurious way. Our angle was to not only give content to consume but to offer an experience from the get-go, as Sacrebleu's future customers and partners interact with the brand's material from the very first time. 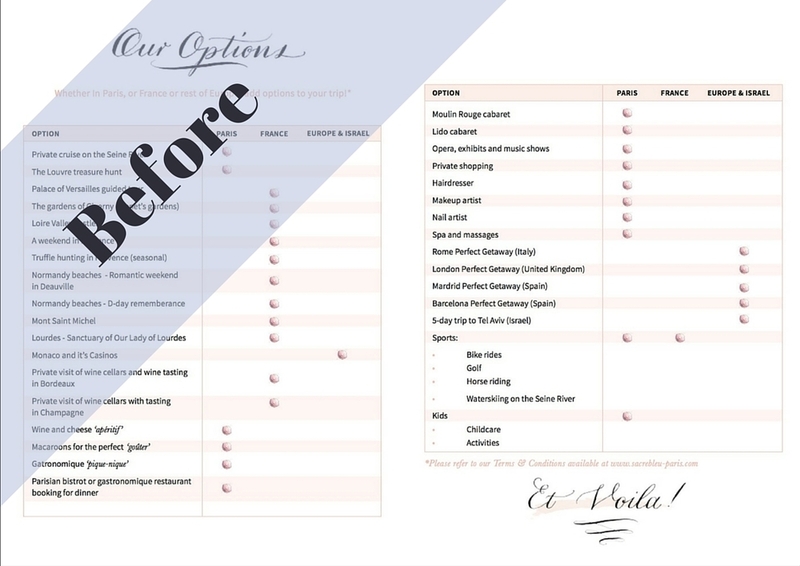 We wanted something that would look beautiful and feel luxurious, and yet be versatile enough to convey the experience both online and in print format. We chose to present the new offering in a luxury magazine format. 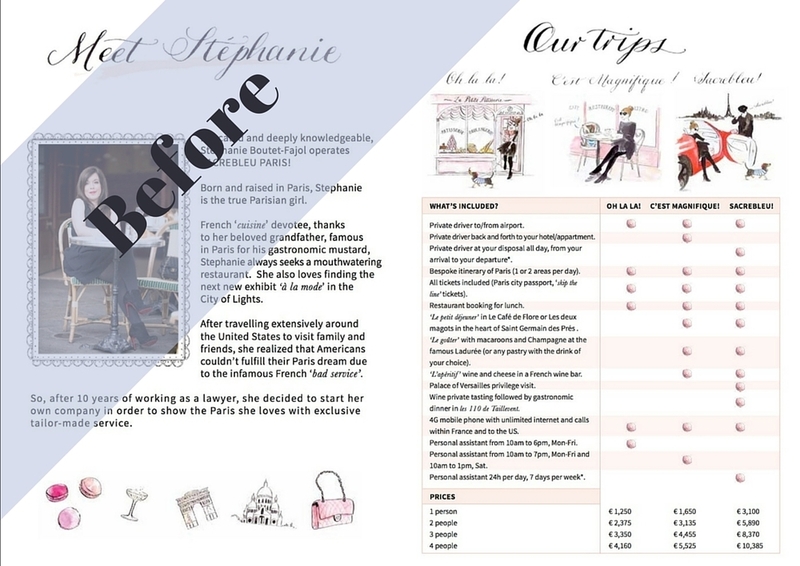 We kept the calligraphy and illustrations that were used in the pre-existing brochure [by the way, take a look at Gemma Milly's fabulous work!] and we created everything else, including the editorial part and the layout. 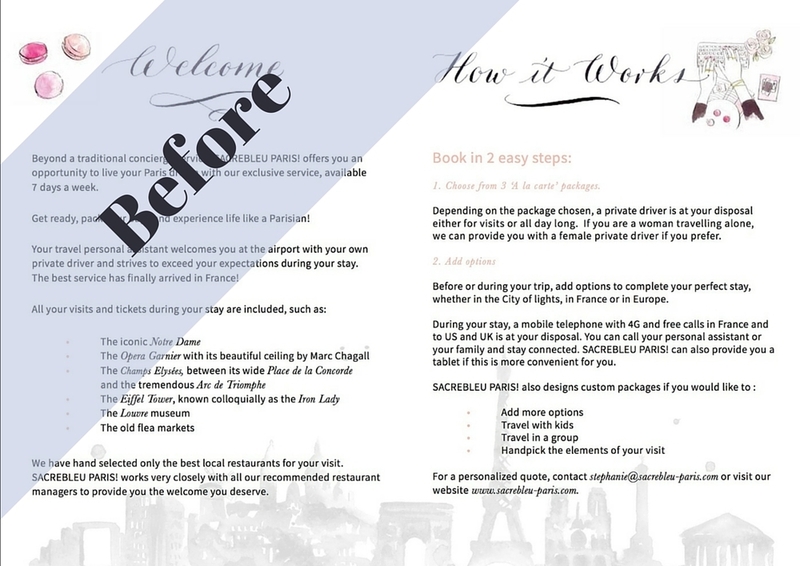 Sacrebleu Paris' brochure is more than just a visual display -- it's a pre-taste, un avant-goût, of the experience to be lived through Sacrebleu Paris' bespoke services.